The Research Design Service bulletin for June 2103 is now available. What can the Research Design Service (RDS) do for you? The Alzheimer’s Society led a Dementia Priority Setting Partnership with the James Lind Alliance to identify some of the priorities for dementia research. Through extensive engagement with people with dementia and their carers, health and social care practitioners, and organisations that represent these groups, over 4,000 questions on the prevention, diagnosis, treatment and care of dementia have been whittled down to a top 10 list. Twitter is a form of free micro-blogging which allows users to send and receive short public messages called tweets. Tweets are limited to no more than 140 characters, and can include links to blogs, web pages, images, videos and all other material online. You can start tweeting in 10 minutes, anytime, from your computer, smart phone or tablet. By following other people and sources you are able to build up an instant, personalised Twitter feed that meets your full range of interests, both academic and personal. Thousands of academics and researchers at all levels of experience and across all disciplines already use Twitter daily, alongside more than 200 million other users. Yet how can such a brief medium have any relevance to universities and academia, where journal articles are 3,000 to 8,000 words long, and where books contain 80,000 words? Can anything of academic value ever be said in just 140 characters? 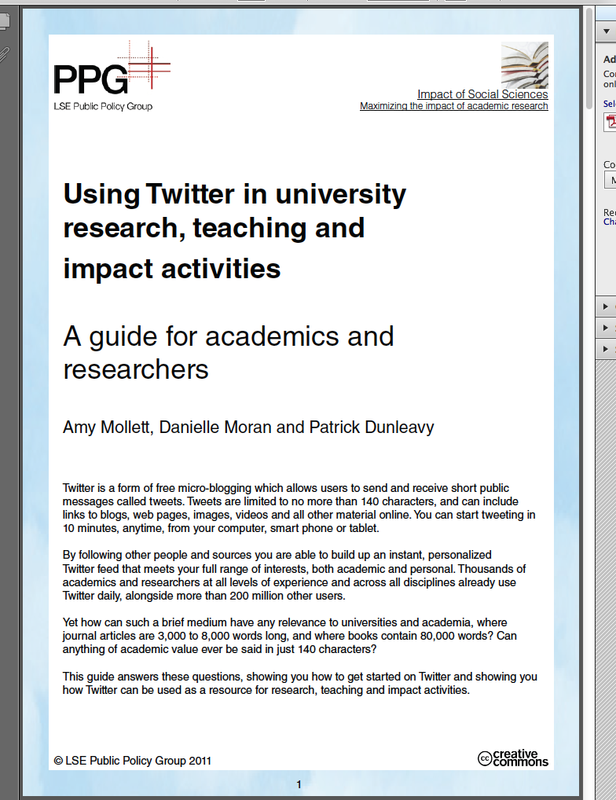 This guide answers these questions, showing you how to get started on Twitter and showing you how Twitter can be used as a resource for research, teaching and impact activities.